By Nick Ostdick. Oct 1, 2016. 9:00 AM. There comes a time in any great series of books when the tides turn—when, for some reason or another, the characters, plots, themes, or messages of the books fall out of favor or have their relevancy or worth challenged, both for the writer and the reader. 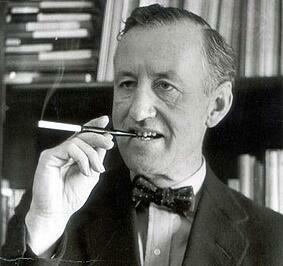 For Ian Fleming and his James Bond novels, that time came with Dr. No. (1958), the sixth book in the Bond series under Fleming’s watch. In hindsight, perhaps the spiral in critical appeal—though the commercial success of Dr. No remained aligned with the Bond novels that came before—was inevitable. After all, Fleming was uncertain about Bond’s future following the completion and publication of the previous 007 adventure, From Russia with Love, so much so that he waffled on whether to kill off his titular character. In fact, early versions of the book actually saw Bond’s death scene played out in some kind of melancholic, triumphant glory. With the series author on the fence about whether and how to continue this much-lauded series, it’s easy to see why many critics—and subsequently Bond scholars—view Dr. No as chaotic and unfocused: a novel written with only half a heart that relies more on tropes rather than forging any new ground. With this in mind, let’s examine Dr. No to try and discover just why the novel received a less than stellar reception, and how it’s held up since its initial publication. Dr. No picks up right where From Russia with Love left off with Bond recovering from his poisoning at the hands of SMERSH agent Rosa Klebb. Upon his return to London, M sends Bond to rest and recover on the island of Jamaica where he is quickly instructed to investigate the disappearance of another MI6 agent, Commander John Strangways, who was working on the island. Bond is briefed that at the time of his disappearance, Strangways was investigating Dr. Julius No, a reclusive Chinese-German islander who owns and operates a lucrative guano mine. Upon his arrival, Bond, who realizes he’s being watched, defies two attempts on his life before traveling to Crab Key where No is said to live and work in order to conduct closer surveillance. Once there, Bond meets a young woman named Honeychile Rider, who is collecting valuable shells on the beach. No’s men quickly capture Bond and Rider for trespassing on his land, and, after an integration, Bond discovers No is working with the Russians to build a secret underground missile launch site where United States missiles can be sabotaged. A daring escape ensues, and Bond is forced to complete a deadly obstacle course through the facility’s ventilation system in which he suffers severe shocks and wounds. The cat and mouse game between Bond and No culminates with a harrowing final face-off. Bond kills No with a guano-loading machine, essentially burying No alive. Bond and Rider finally escape from the island using one of No’s beach buggys, leaving the entire operation in shambles and to rot. The earliest germ of Dr. No began nearly two years prior to its publication in 1956 as a screenplay Fleming was asked to write for producer Henry Morgenthau III called Commander Jamaica. The screenplay, which did not include any mention or inclusion of the 007 universe, contained much of the same plotline and the same villain, Dr. No. However, when the project was scrapped shortly after Fleming completed the screenplay, Fleming was struggling to start his next Bond novel and decided to reimagine the story as the next Bond adventure. A bulk of the novel was completed during 1957 at Fleming’s Goldeneye Estate in Jamaica. In fact, some Bond scholars argue part of the novel’s shortcomings stem from Fleming’s over-reliance on Jamaica as the setting for the story, allowing for sloppy, lazy writing and description of a place so familiar to Fleming but so foreign to many of his readers. The novel is notable as both a return to form or a throwback to hardboiled crime novels of the '30s and '40s, but also as the first instances where Bond and M appear to be falling out of favor with each other, a motif some argue is representative of Fleming losing interest in the Bond series. 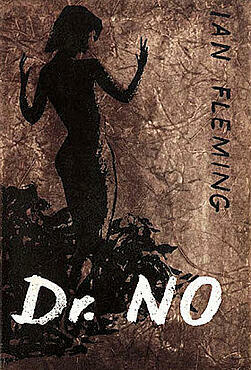 As with all previously published Bond novels, Fleming played a major part in the conception of the cover art for Dr. No. Fleming believed Honeychile Rider or some likeness of her should be featured prominently on the cover due to her Venus-like qualities, which Fleming wanted to emphasize to the reader from the moment they had the book in hand. Fleming collaborated with artist Pat Marriott to design the cover, which features the silhouette of a woman half-turned away from the reader against a beige, sandy-colored pattern meant to resemble wet, compacted sand or shards of seashells half-buried in a beach. The first U.K. edition of Dr. No featured a print run of about 20,000, many of which were library editions which can make collecting unmarked copies of the novel a challenging enterprise. As with all first editions of Bond novels, the title page should consist of the publisher and the title—the back page should not contain anything but the publication year. In addition, no references to editorial or critical reviews should be present on either the front or back title pages. Subsequent paperback and U.S. editions of the novel saw extensive changes to the original cover design and are considered much less valuable than the Jonathan Cape first editions. Dr. No has been translated into a host of languages, was the first film adaptation of the Bond series, and has never been out of print.